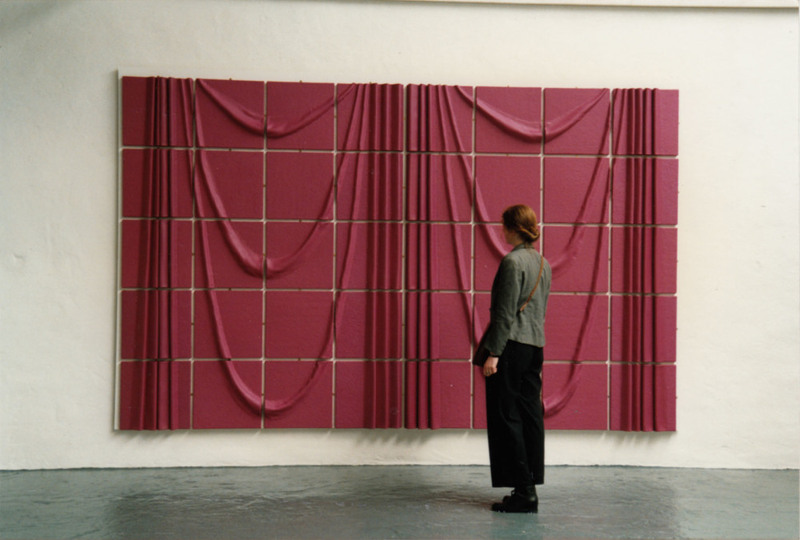 Consisting three large (8' x 12') sculpted curtains, each a grid of forty Plasticine covered canvases, the installation Curtains continues an interest in cinema, television, theatre and the notion of the spectacle. In the theatrical or cinematic space, curtains mark the passage from the everyday into the seduction of the space of entertainment; Curtains explores and subverts the notion of the spectacle and in Curtains the curtain itself becomes focus of attention. 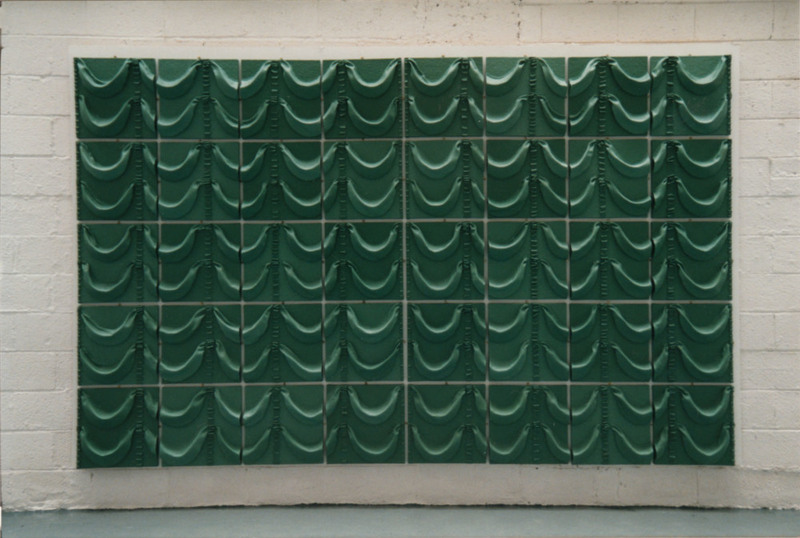 Folded, molded and manipulated to create bas relief impressions of the drapery of the theatrical or cinema curtain, green, blue and mauve Plasticines create expanses that frame the gallery space and gallery audience. The domestic material Plasticine, normally used for small scale modelling is extended and elevated to the epic. Each curtain is composed forty sculpted panels, this formal structure draws reference to the Greek bas relief frieze; though instead of an illustrated narrative the image is of a static screen which can only hint at the possibility of movement. 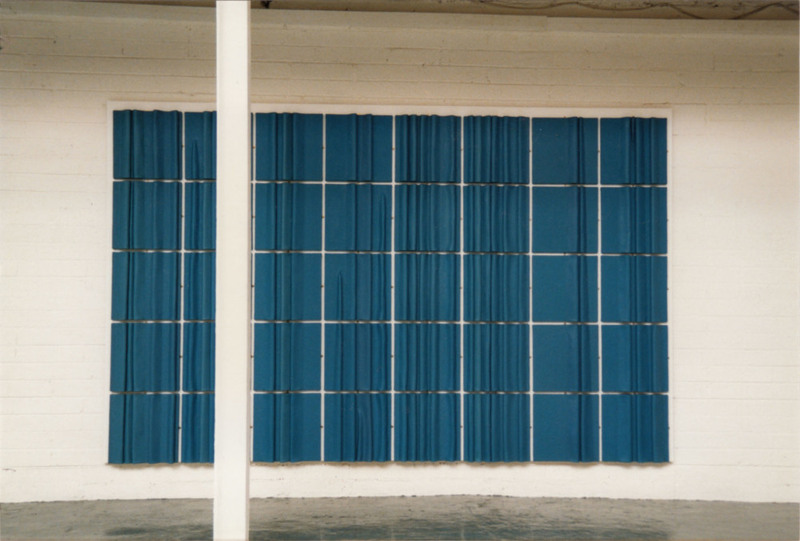 The artist's interest in the grid and order of system and repetition extends from earlier work such as the body of paintings, Liptych, 1994. 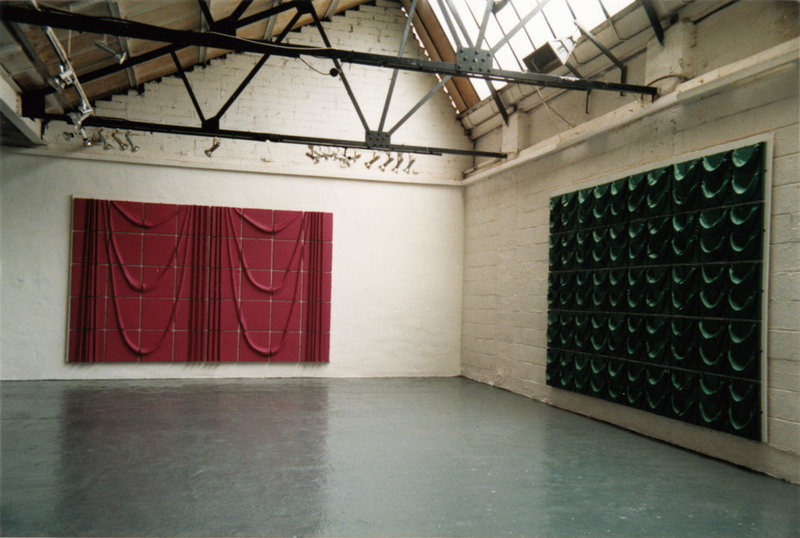 The three works in Curtains cling to the gallery wall, maintaining a tight relationship to painting. 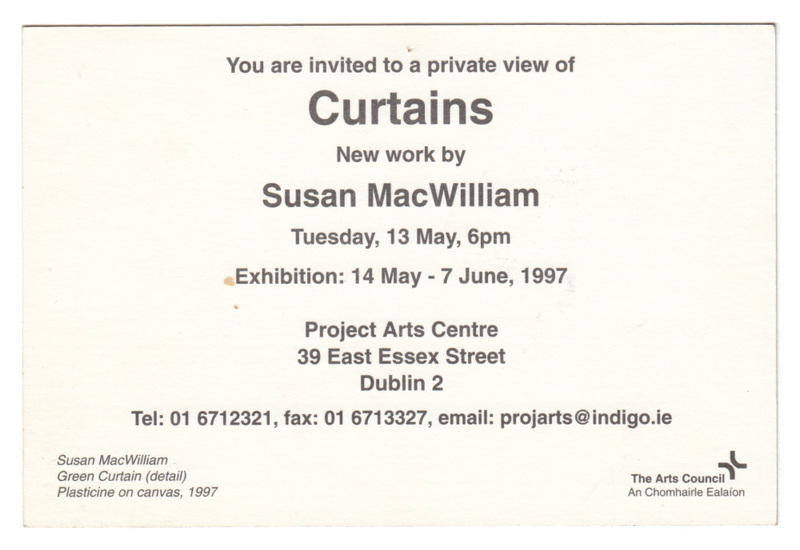 Curtains suggests the possibility of movement within a theatrical context. 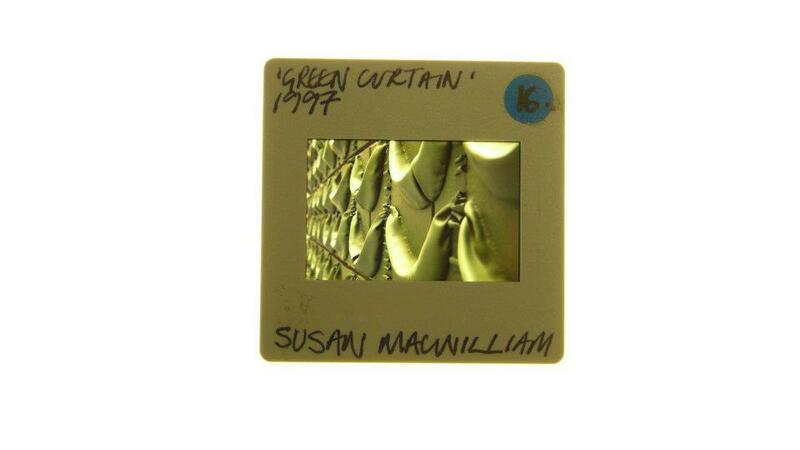 Curtains develops a play on presentational devices of painting and theatre that Susan MacWilliam has been exploring over the past three years or so. 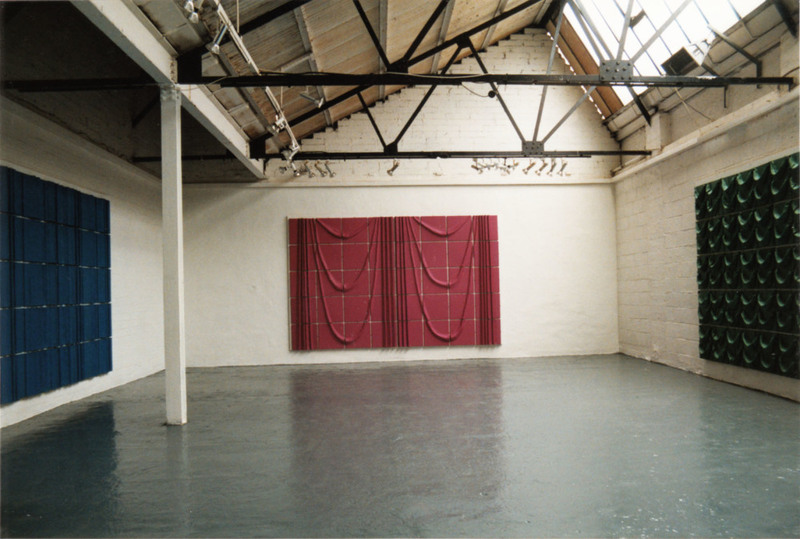 In Disco, shown in 1995, a canvas was presented as emerging dramatically from between a set of electric blue stage curtains, illuminated from above by a spotlight, and making the end wall of the gallery space at Catalyst Arts resemble a proscenium. 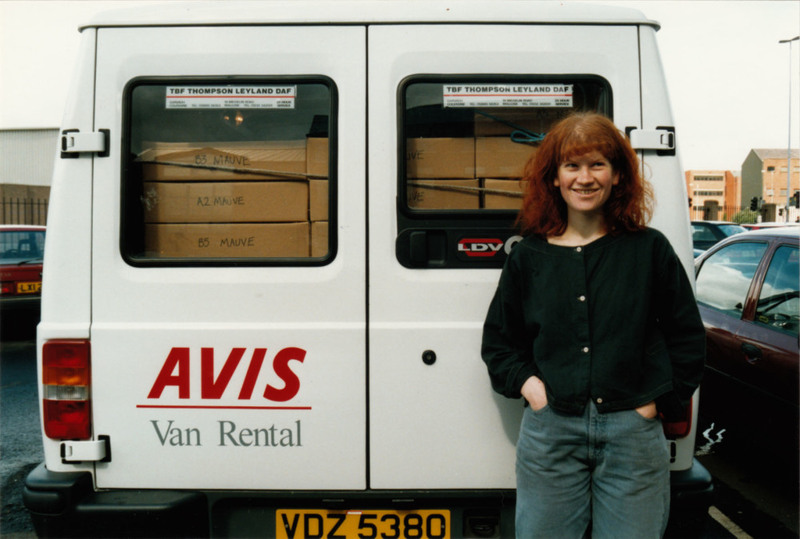 Small pairs of shoes, the same glittering red as the canvas, poked out from behind the curtain at floor level. Here, things have been rendered more formally cool for a space that already operates as both gallery and theatre, a fact that the artist exploits. 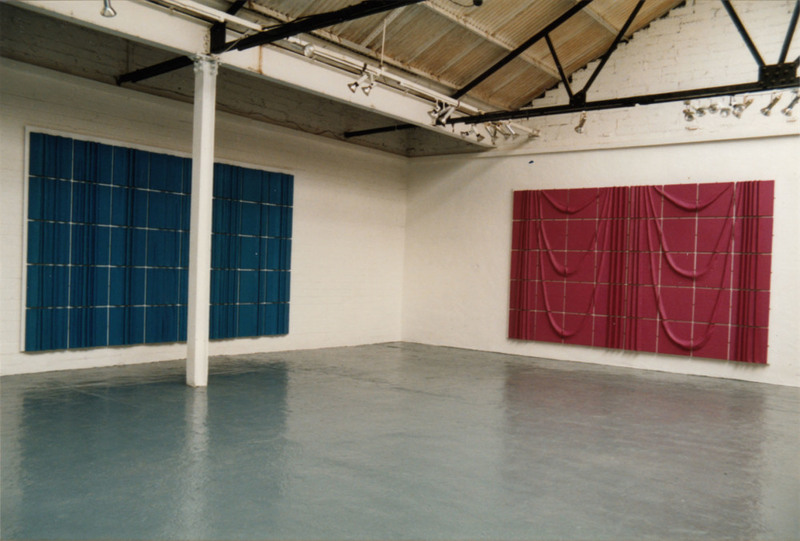 Three large works (8x12ft each) — blue, red and green and of increasing degrees of decorative elaborateness as you pan from left to right on entering the space — only read as fabric curtains briefly. 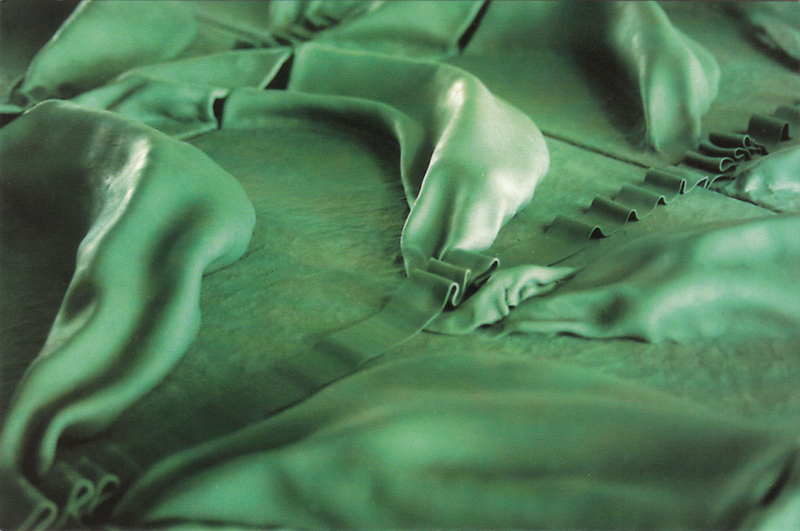 Their medium is actually plasticine on canvas that has been rolled, folded and moulded to suggest fancy pleated cinema or theatrical drapery. The surface of the canvas is covered with a layer of the stuff, finger and thumb prints the evidence of the process of its application. 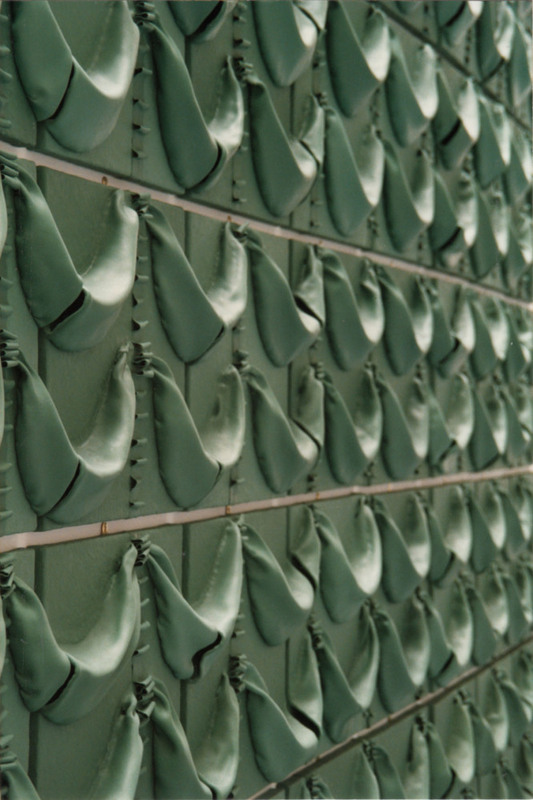 The smoother folds and pleats emerge out of this surface, projecting as a shallow relief of around three inches. Forty square canvases, a three-quarter-inch gap between them, actually make up each of the three curtains - the folds, arcs and swoops of the 'fabric' broken by, then continued, the other side of these gaps. The reference may be to classical sculptural reliefs, modelled in sections before being applied to the architecture that they were designed to decorate and, of course, often using drapery to suggest a fullness and depth that was not actually there. Here, the depicted objects — curtains — already make reference to illusion or to the suggestion of something 'behind' whose eventual appearance is anticipated. But looking through the gaps only reveals mirror plates and the wall to which they are attached. 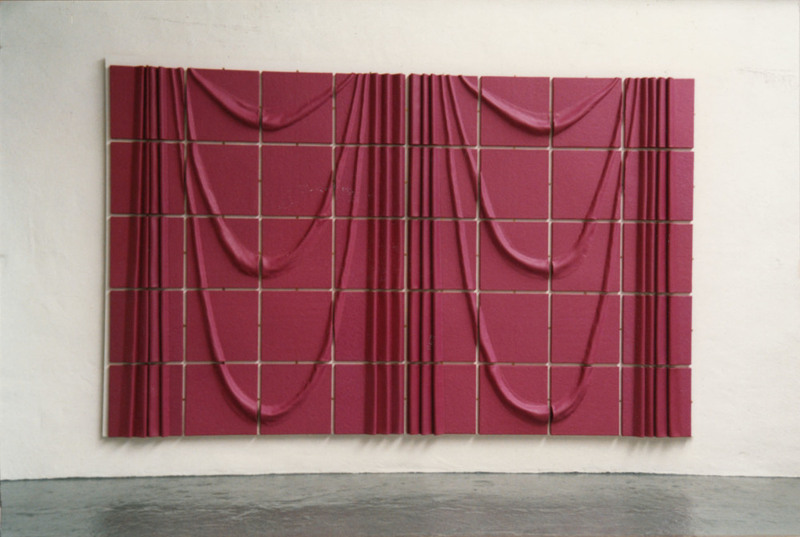 These low reliefs are more a development of painting than of shallow relief sculpture: the canvases act as nagging reminders of at least one of Judd's 'several limits of painting', and plasticine is like paint extended anyway — paint that does not dry as much as clay that does not harden. 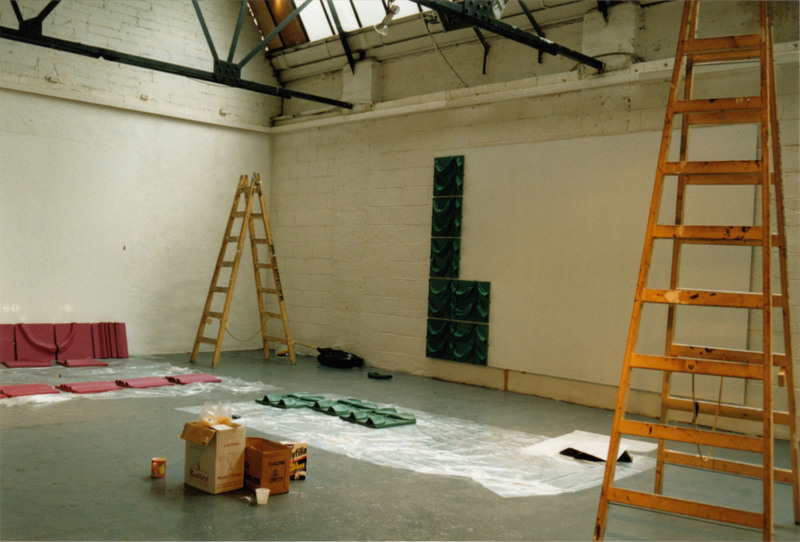 Or as Greenberg might have put it, paint made opaque, its 'proper character' emphasised. 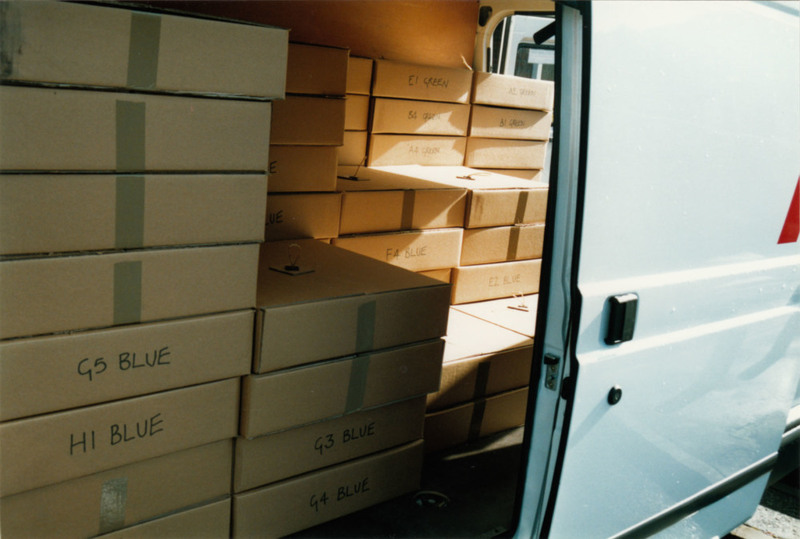 It was Greenberg actually who envisaged the task of the visual arts as one of excluding 'literature' which, for three centuries had dominated the other arts, forcing them to conceal their intrinsic properties. So this work could be seen as some sort of comically mistimed avant-garde manoeuvre by a visual, artist against the Dublin literary/theatrical tradition. Or as a comment on the 'pervasiveness of the spectacle' (cinema as that aspect of the leisure industry which is alienating, non-participatory, stupefying, etc) taking us literally to the threshold of spectacular space but pulling back and proceeding to make some kind of bravura demonstration of the hands-on, plastic, material joy of modelling in paint, clay, plasticine or whatever. This aspect of the use of plasticine is emphasised here, the volume of it, for instance, reaches a kind of joyous critical mass; the colours are the three primaries of plasticine — snot-green, pinky-red, aqua blue — which we all remember turn that kind of grey-brown mess when mixed. 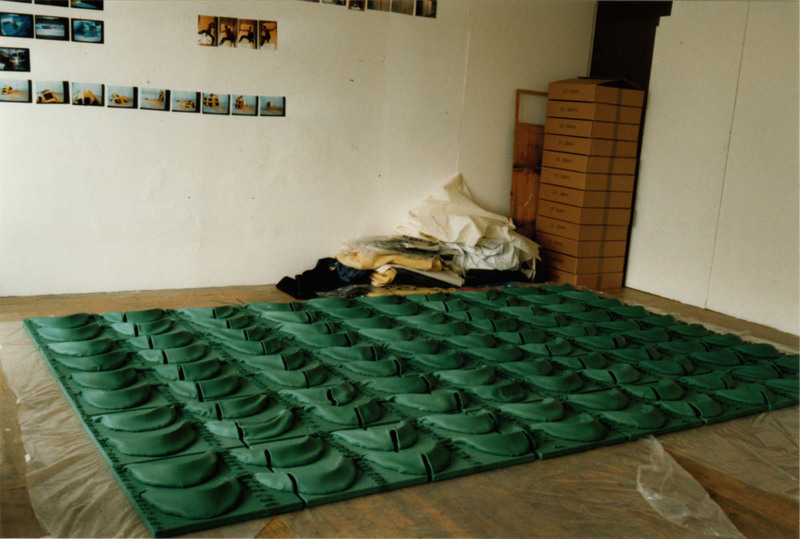 The sense of a special technique devised for working the stuff is there in the work too, suggesting hours of meditative absorption in the studio. But that is only half the story here, surely. Theatrical curtains are there to give symbolic form to the passage from the material world to another, fictive, dimension and making such a big deal of their materiality must also celebrate pleasure taken in what goes on on both sides of the curtain. 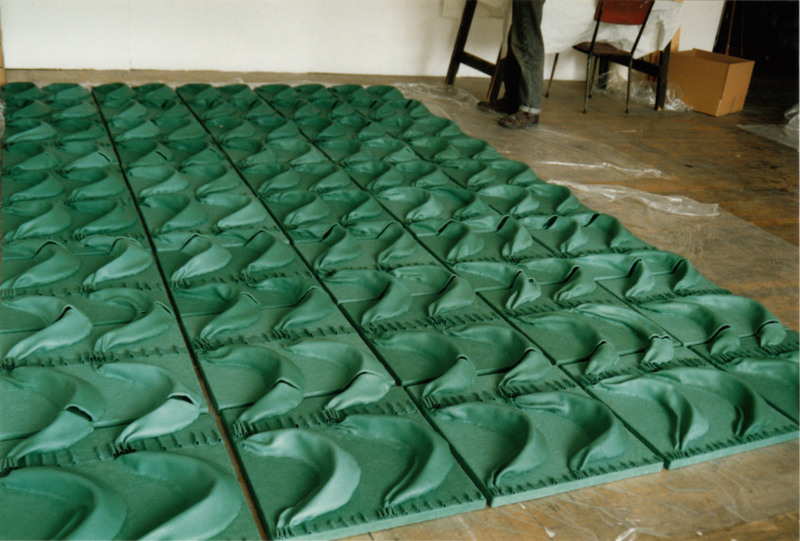 Apart from the suggestion that rendering their fabric in plasticine indicates some kind of desire for a sublime that is both formed and formless and is an essential part of the cinematic experience, the material's associative and literary meanings have to be taken account of too. Modelled forms inevitably take on a greasy and animated volition of their own — a Tony Hart morphology — that goes way beyond the stage of distended paint. Last year MacWilliam made a piece for a Halloween night exhibition at a 'haunted' house just out-side Belfast. In an empty room upstairs, again dramatically spotlit as if for the opening or closing scene of a play, a cuddly bunny lay with its stomach slit-open, its spilt guts gleefully modelled in plasticine. Any material pleasure to be had there could only have been pretty sick and offered proof, finally, of the corrupting influence of cinema and theatre on impressionable minds. Mark Orange is an artist based in Belfast.